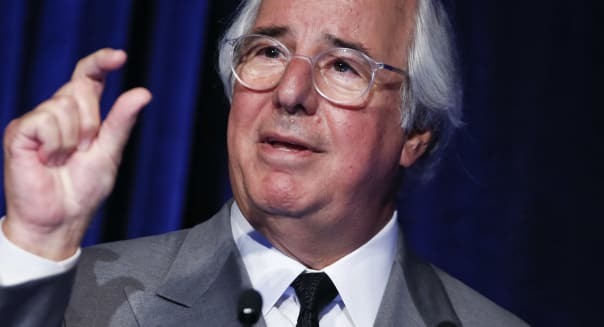 Brian Ach/Invision for Advertising Week via APFrank Abagnale, a former fraudster and subject of the film "Catch Me If You Can," speaks at Advertising Week in New York City in 2012. NEW YORK -- Choosing a financial adviser is one of the most important decisions an investor can make. Good judgement can make the difference between a retirement spent traveling around the world and anxious weeks between Social Security checks, so competence is a big must. Not investing in Pets.com is just one step, though. A good financial adviser also needs to be honest, because trusting your retirement plan to a crook can be nothing short of devastating. Financial fraud is nothing new; from bogus IRS collection schemes to sweepstakes scams, financial scams cost the elderly alone nearly $36.5 billion a year. Most cons rely on a little bit of distance between predator and prey, though, generally with a volume approach to finding victims. As a result, people are inclined to trust someone they meet in person. %VIRTUAL-pullquote-It's not like your email scheme where you can get nickel and dimed, which is a lot more common. This is a much more mile-deep kind of fraud.%That might be a costly mistake. According to spokesman for the Commodity Futures Trading Exchange Michael Herndon, fraudulent financial advisers don't just operate in person. They thrive that way. "It's not like your email scheme where you can get nickel and dimed, which is a lot more common," Herndon said. "This is a much more mile-deep kind of fraud. People turn 65 and think that they're investing with someone who's legitimate, they give [the adviser] their entire life savings, and then find out that it was a scam." "It's financially devastating," he added. "Literally it destroys lives sometimes." Herndon tells stories about phony advisers that sound like something out of a Hollywood screenplay. Operating in well-appointed offices, they fleece people out of their life savings with promises of investment riches. They take clients' money without investing a dime, and can eventually skip town with hundreds of thousands of dollars in ill-gotten gains. It could almost be entertainment if the consequences weren't so ruinous. On film, con men operate with a wink and a smirk, fleecing the wealthy out of easy money. No one ever sits through an epilogue where the mark's children have to drop out of college or a family loses its home. That part would hit closer to home. Financial adviser fraud works by first stealing the trappings of legitimacy. They'll operate in person, shaking hands and arranging to meet in their neighborhood office, generally one with degrees on the wall and support staff in front. They stay in communities for years at a time in order to build up trust and the word of mouth reputation that brings in new clients. In fact, according to Herndon, reputation is key to the business model. They need the victims' trust, and there's no better way to do that than by getting references from neighbors and friends. "It's not fly-by-night, like a grifter drifting in and out," Herndon said. "People have built some credibility within the community, and that may take months or even a few years." "People watch the movies and think, 'That would never happen to me. I've seen it on the screen, I know what happens,'" he added. "But the victims over and over again say, 'I believed it. They had an office and they were nice. They came over when I broke my leg.'" Generally most fraudulent advisers work in communities to create networks among friends and neighbors. Churches are popular targets for their close-knit nature, where the con men will join a local congregation and sing hymns for a while before offering that first someone the deal of a lifetime. It's all about building trust so when the time comes to ask for a check people will take a chance. As for the money, it's a straightforward Ponzi scheme. Despite the promises of grand returns, phony investors never actually place a dime in the stock market. They will publish earnings reports and fake account statements showing fantastic returns month after month in order to keep clients from asking questions. When someone asks for their money back, it comes out of the next investor's capital in exactly the same way that Bernie Madoff beat the market for decades in a row. "They'll start sending out fake account statements," Herndon said, "so in the first month, your $50,000 went to $55,000. In the next month it goes to $60,000, then it goes to $70,000, and you'll think this account is doing great, but that's just a piece of paper. The money actually went to Vegas with him and up his nose in a line of coke." An investment scheme is a house of cards, one that lasts as long as the con artist can keep money in the account. When too many people want their money back, or when the con artist can't line up a next investor, it's time to pack up and leave town. In the adviser's wake, he leaves a community of empty retirement accounts and wiped out investors. So with this note of caution, how can investors safely watch out for con artists in the guise of a friendly, neighborhood fund manager? There are a few red flags to look for. First and foremost, beware of the hard sell. Phrases like "act today" and "it's your loss" rarely come from legitimate or cautious traders. Instead, they're the stock and trade of someone trying to pressure you into an emotional decision, shortcutting reason in favor of fear. "And," Herndon said, "always, always look out for 'guaranteed return.' That's the scariest word." Don't get greedy. They say you can't con an honest man, so beware any promises of easy money that sound too good to be true, and when a friend recommends services, ask if he's actually seen any of those returns. It's one thing to have pulled out a few thousand here and there, but has this investor ever turned over the full value of someone's account? Investors should also run background checks before handing over any money. The challenge with investment is that once you've given someone the money, there's almost no way to control what the adviser does next. Consumers trust their broker, and to some extent the law, but ultimately there's no mechanism in place that actually stops someone from cashing out and running. Threats of law enforcement can only do so much, so it's worth making sure the gentleman with the nice office and Harvard degree is who he says he is. On the website Smart Check, individuals can check the background of an investor and whether he is registered as a financial adviser. The overwhelming majority of fraud is committed by outsiders to the system, con artists rather than professionals gone bad. "Just because someone is registered doesn't mean that they won't commit fraud," Herndon said, "[but] if that person doesn't show up in a database where a financial adviser is supposed to show up, that's a huge problem." Finally, trust experience. Although it makes life harder for new advisers looking to cut their teeth, the reality is that spotting a con can be incredibly difficult for the average consumer. Someone whose firm has been around 20 years is less likely to have a scam running than someone who got to town 18 months ago. Or at the very least, maybe that experienced adviser will have some property to seize if things go wrong.